Verbs in English always confuse students while learning English. 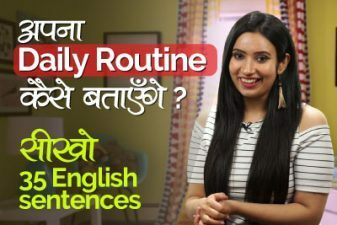 In today’s English speaking practice lesson in Hindi, you will learn about the commonly used English verbs and to correctly use them in English sentences. This lesson is not about learning tenses in english, we would cover that in some other lesson as English tenses are vast. You are watching this video on Learnex, where you learn English through Hindi. We have a library of English lessons in hindi specifically designed for Hindi speakers and competitive exams. Access through our pool of free English classes covering topics such as – English Grammar course, English conversation, Communication skills, Vocabulary, English practice, English speaking for the real world, Spoken English tips to improve you English, Personality development, IELTS training & Coaching, Job interview skills and much more to help you speak fluent English faster and better.